HB 1313, which passed the House 52-45 on Jan. 29, is strongly supported by the Washington Work and Family Coalition, which includes the Washington State Labor Council, AFL-CIO, and many other labor and community organizations. The coalition will be testifying in support of HB 1313 on Wednesday and is encouraging all to attend the hearing and sign up in support of the measure. TAKE A STAND — If you can’t attend the hearing, click here to send your Washington State Senator a message urging him or her support HB 1313. You can also call and leave a message for your senator on the toll-free Legislative Hotline at 1-800-562-6000. BACKGROUND — HB 1313 is a public health issue. 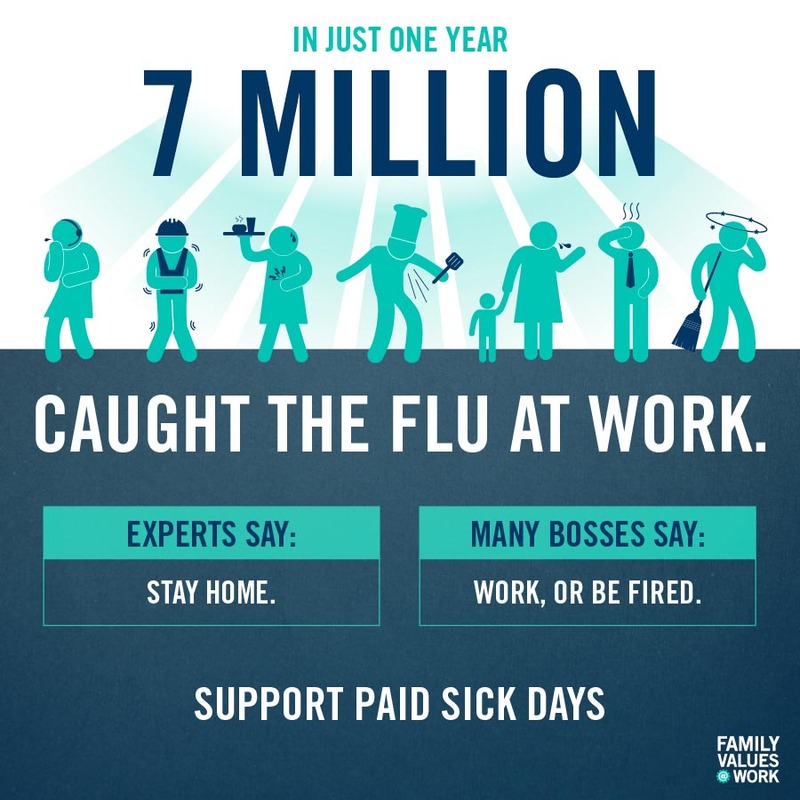 An estimated one million workers in Washington do not have access to paid sick days. Many of them work in the restaurants, grocery stores, medical centers and other service-oriented jobs that involve interacting with the public. When people are forced to choose between working sick and losing pay by staying home, they often feel they have no choice but to endanger their co-workers and the public by working sick. A new national poll conducted amid this year’s flu season found that more than one in four American workers said they recently showed up to work while ill, even though they could sicken their colleagues and/or the public. HB 1313 shouldn’t be a partisan issue. Polls show that overwhelming majorities of Americans — including those who self-identify as Republicans — support requiring employers to offer some level of paid sick leave. Allowing people to address their health needs, or their family’s, or to cope with the consequences of domestic abuse without losing a day’s wages is a right that workers have in every industrialized nation on the planet, except in America. A large majority of them reported that the law did not affect business operations and that they had no or only small increases in costs. Businesses most frequently covered absent workers by assigning the work to other employees, a solution which has little effect on costs. Just 10 percent of employers reported that the law caused their costs to increase by 3 percent or more. Meanwhile, Connecticut employers reported decreases in the spread of illnesses and increases in morale, among other effects, leading the report’s authors to conclude that the paid sick leave standard has been good for business. HB 1313 is pro-family legislation. Please send your Washington State Senator a message urging him or her support HB 1313. You can also call and leave a message for your senator on the toll-free Legislative Hotline at 1-800-562-6000. Posted by David Groves on Feb 25 2014. Filed under STATE GOVERNMENT, TAKE A STAND!. You can follow any responses to this entry through the RSS 2.0. Both comments and pings are currently closed.